BITSAT 2018 (बीआईटीएस प्रवेश परीक्षा): Birla Institute of Technology and Science is going to conduct its admission test for the students who are seeking admissions in BITS Pilani. The interested candidates can register online for BITSAT 2018 Application Form before the last date, i.e. in March 2018. The application process will commence in the month of December 2017. 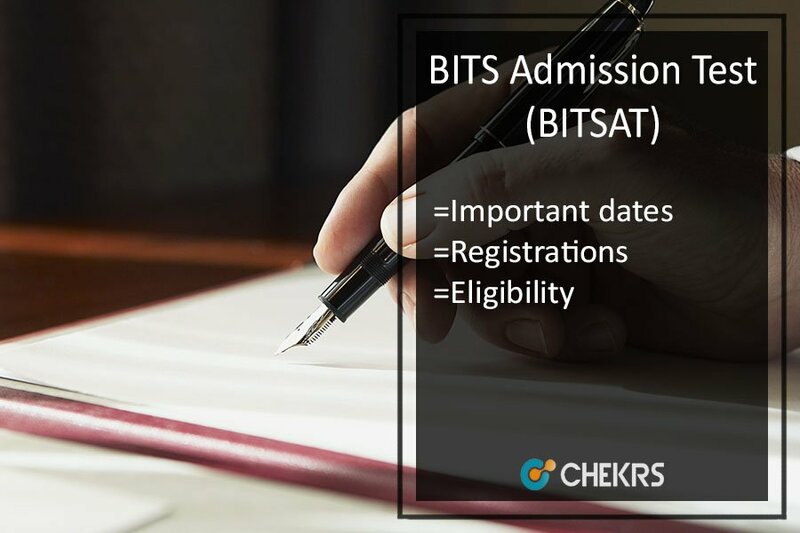 Every year around 2 lac student applies for BITS Admission Test and for that they have to submit the completely filled BITSAT Application Form till the last date. Birla Institute of Technology and Science has the campus at Pilani, Goa, and Hyderabad with the 2000 seats for new admissions each year. The students who are seeking admissions in BITs, there is a good news for them. The BITS Admission 2018 is going to start. The students have to apply for the BITSAT Online Application form 2018 before the due date. The entrance exam will be conducted in the month of May. The students who will clear the cutoff ony they will get selected. The BITSAT Registrations 2018 will end in the month of March. The students who will submit the form only they will be eligible for the entrance test. The online application submission process has already started at BITS Pilani official website.in/. The eligible candidates will be able to register themselves online by submitting the BITSAT Application Form 2018 between the dates December to March. The candidates are advised to make sure that they are meeting the eligibility norms in all the aspects. A candidate can apply only once for BITSAT 2018, so they are advised to fill the registration form carefully and recheck it before its final submission. The complete BITSAT Application Procedure is given below, follow the procedure to apply online for BITSAT 2018. Applicants need to visit the official website of BITSAT. Follow the notification link and search for BITSAT advertisement 2018 and information brochure. Read complete eligibility criteria and all the necessary details. Click on “apply online” link after meeting the eligibility norms. Fill all entries in the application form. Attach the scanned copies of required documents and necessary attachments. Don’t forget to pay the application fees by online process. Recheck all the filled entries and click on submit button. The syllabus of BITS Admission Test 2018 is given below as per the subjects that are included in BITSAT Syllabus. Total time duration: 3 hours. Total No. of questions: 150 questions. The admit card of the exam will be provided online before 01 month of the exam. BITS Pilani will conduct the BITS Admission Test in May 2018. As per the latest updates in the local newspaper, we are predicting that the candidates will be made available with the BITSAT Hall Ticket 2018 in the 01st week of May 2018. The admit card will be provided online for all candidates who have successfully submitted the application form. Without admit card the candidates cannot appear for BITS Admission Test. The exam centres of BITSAT are all across the country. There are 47 exam centers in India and some centers are outside India for NRI candidates. The exam centers will be decided after the completion of application submission process. The result of the exam will be provided online after the 2 weeks of the exam. The BITSAT 2018 Result Date is not announced yet but it is expected that the result will be provided on the official website in the month of July. The candidates who qualify the BITS Admission test 2018, they will be allotted the seat in the BITS Classroom Engineering Programs. The results can be checked by entering the valid name or roll number in the desired places. Candidates need to qualify the online entrance exam for getting the admission in Birla Institute of Technology and Sciences for pursuing their B.Tech degree. After clearing the BITSAT Cutoff the candidates will be called for BITS Admission Counselling 2018 in that process, the candidates need to fill the college choice form along with their desired stream of engineering. The BITSAT Seat Allotment 2018 will be done for the students according to their choices filled in the counseling form and the BITSAT merit list. At the end when the seat is allotted to the students, they have to report at the college for document verification and confirmation of seat. For feedback regarding BITSAT 2018 Admissions, you can contact us by commenting in the comment section given below.